There's no denying The Plaza is an international icon of splendour and luxury. When I mentioned to my relatives, friends and colleagues I was headed to The Plaza for afternoon tea, no description was required – they already had the necessary imagery… and envy. 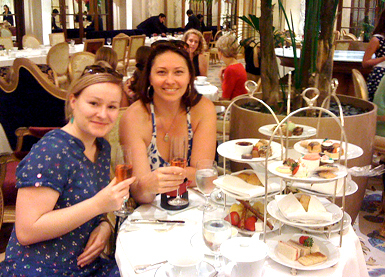 Afternoon tea takes place in the Palm Court. This is set under a 1,800 square foot stained-glass ceiling, recently restored to its origins through a $6.5 million dollar renovation. Think high ceilings, grand proportions, pristine symmetry and Fitzgerald’s The Great Gatsby. The setting offers a nice escape from the bustling city avenues outside and in our case, respite from the rising temperatures of New York in August. 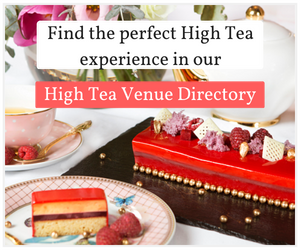 The high tea menu is a fusion of traditional elements with a new generation of style. 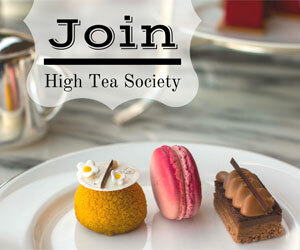 Executive chef, Willis Loughhead and pastry chef, Jasmina Bojic have created four tea options with contemporary flair. When we visited, we were lucky enough to sample all four – which was a gastronomical amount between myself and our photographer. These included The Classic, The New Yorker, Chocolate Tea and a children-focused Eloise Tea. 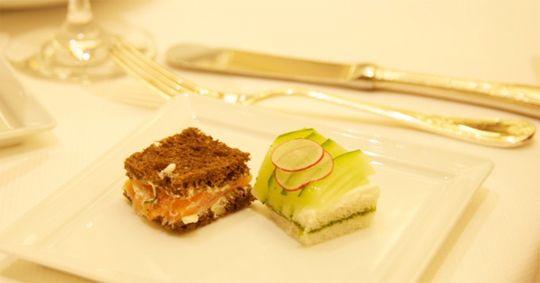 The Classic includes the quintessential afternoon tea sandwich selection of truffled quail egg, roast beef, cucumber, smoked salmon and for something unique, Main lobster. The freshly baked and seasonal scones are served with double devonshire cream, lemon curd and preserves. 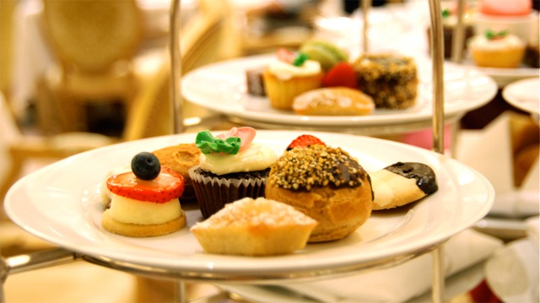 Follow this up with pastries and sweets out of lemon tea cake, hazelnut napoleon, sacher torte, fruit and French macarons for a reasonable $48 per person. The New Yorker is very similar with a bit of prosciutto, mozzarella and pesto in the mix. While the Chocolate Tea includes a fondue of strawberries, cake, pretzels, marshmallows and golden pineapple with more chocolate sweets and Nutella-spread scones. 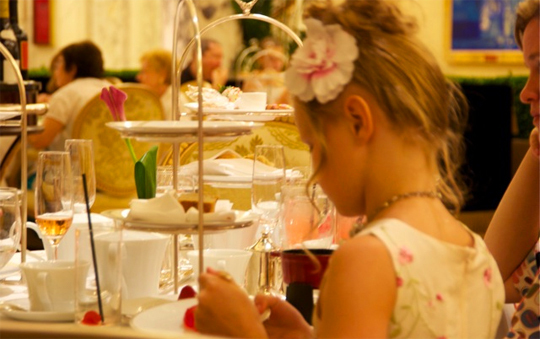 The Eloise Tea offers a cute child-friendly service including the mainstays of grilled cheese and peanut butter and jelly sandwiches to name a few. Washed down with pink lemonade or peppermint iced tea – it’s sure to be a favourite with the littles ones. 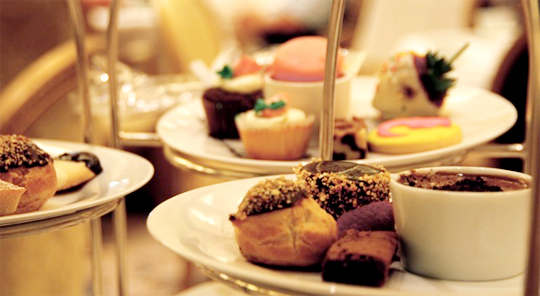 PASTRIES AND SWEETS: Pâté de fruit, Sacher Torte, Lemon Tea Cake, Hazelnut Napoleon and French Macarons. Service was impeccable and one of the highlights. We enjoyed listening to Frederico, a waiter who has been with The Plaza for 14 years, recount stories of life before the restoration and past visitors of note. The loose leaf tea selection is diverse and has the obligatory black, green, herbal and fruit infused options as we all as some signature blends by The Plaza. We tried the Montebello Apple Spice – a juicy herbal tea with notes of sweet apple, roasted cinnamon and ginger and the Madame Butterfly Jasmine (jasmine and green notes). For an extra $20, you can add a glass of Champagne (Veuve Clicquot Yellow Label or Rose, or Perriet-Jouët) or Bios Baco Oloroso Sherry to the three teas. When you’re next planning a trip to New York, be sure to consider this timeless and memorable experience. 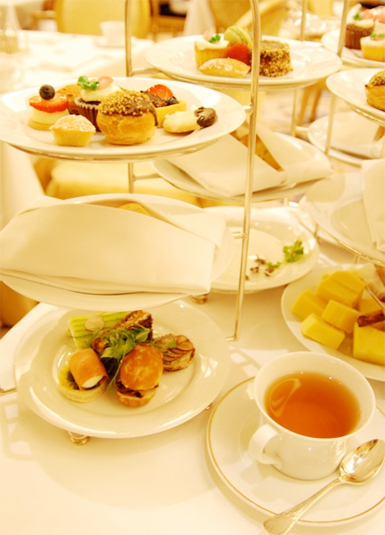 Visiting The Plaza was something I’d always wanted to do and what better way than the extravagant tea sitting. 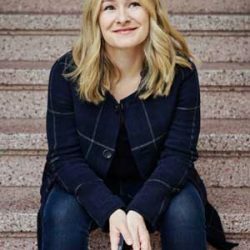 Kate Kendall is a British-Australian entrepreneur and writer based in San Francisco. 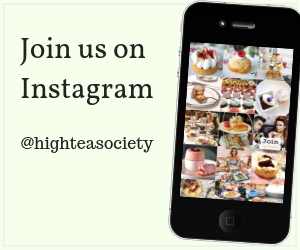 She's reviewed high tea services across multiple continents, and was an early contributor to High Tea Society. Her favorite teas include black with vanilla, Mu, and Dragon Well green. Nothing makes her happier than almond chai lattes. To follow her personal and professional pursuits, follow her blog at www.katekendall.com.